Be the first to share your favorite memory, photo or story of Barbara Jean. This memorial page is dedicated for family, friends and future generations to celebrate the life of their loved one. 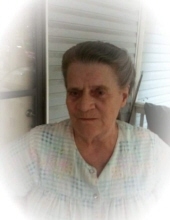 Barbara Jean Shirey Jacobs, age 77 of Mt. Zion, went home to be with the Lord on Sunday, January 13, 2019. She was born June 18, 1941 to the late Waymon and Meggie Shirey. Mrs. Barbara Jacobs leaves behind her husband of 58 years, Waymon Jacobs; two sons: Phillip Jacobs (Amanda) of Eastaboga, Alabama and Tracy Jacobs (Melissa) of Carrollton, Georgia; granddaughters: Brandy Mitchell (Johnny) of Woodland, Alabama, Ashley Jacobs (Greg) of Weaver, Alabama, Shandi Jacobs (Rusty) of Carrollton, Georgia, Khrysta Morgan (Ryan) of Bowdon, Georgia; grandson, Luke Vermillion of Eastaboga, Alabama; five great grandchildren: Hunter Mitchell, Rylea Jacobs, Harleigh Bagby, Eston Morgan and Mason Bagby; one sister, Linda Little of Carrollton, Georgia; two brothers: Clyde Shirey of Bowdon, Georgia and Jimmy Shirey of Bowdon, Georgia; and several nieces and nephews. She also leaves behind her beloved cat of 17 years, Gypsy. She was preceded in death by her parents, Waymon and Meggie Shirey; brother, William Shirey; and sisters: Juanita Watson, Janet Dickerson, and Joyce Shirey. She retired from Trintex Corporation. She was the most loving wife, mother, and grandmother. Funeral services will be conducted Wednesday, January 16, 2019 at 2:00 PM from Martin & Hightower Heritage Chapel with Rev. Anthony Puckett officiating. Music will be rendered by Dawn Jacobs and Steve Hale. The following gentlemen will serve as pallbearers: Johnny Mitchell, Rusty Bagby, Greg Poe, Ryan Morgan, Luke Vermillion, and Timothy Jacobs. Interment will follow in Carroll Memory Gardens. The family will receive friends at the funeral home on Tuesday from 5:00 PM until 8:00 PM. Messages of condolence may be sent to the family at www.martin-hightower.com. Martin & Hightower Heritage Chapel has charge of the arrangements. To send flowers or a remembrance gift to the family of Barbara Jean Shirey Jacobs, please visit our Tribute Store. "Email Address" would like to share the life celebration of Barbara Jean Shirey Jacobs. Click on the "link" to go to share a favorite memory or leave a condolence message for the family.